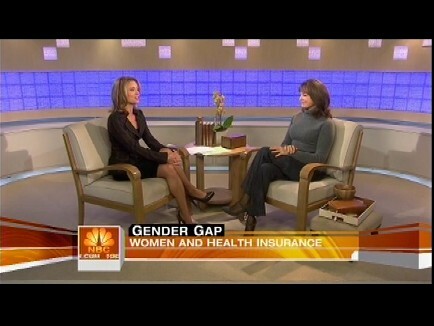 In the name of gender equality, the Today show plumped this morning for government regulation forcing health care insurers to charge men and women the same for individual policies even though women cost insurers more because of greater use of services. Hasn't the financial crisis taught the MSM anything about the danger of government meddling in markets? No. Insurers wind up paying out more in claims under women's policies than men's. Under the circumstances, charging women the same as men would make as much sense as FedEx charging a flat shipping fee no matter how big the box. But that didn't stop NBC medical editor Nancy Snyderman and Today weekend co-host Amy Robach from decrying the unfairness of it all this morning. Their solution? More government, of course. They want legislation to force insurers to charge the sexes the same. But come on. What's the harm, you ask, of equalized rates? Well, let's consider the unintended consequences. Instead of having different rates for men and women, there'd be a single rate that would have to be set somewhere in between. Suddenly, those individual policies would become a bad deal for men and a bargain for women. Men would figure this out and fewer of them would buy policies. On the other hand, women would rush in to this Filene's basement of insurance. Result? Insurers would be stuck with more money-losing policies while watching their profitable customers race out the door. They'd be forced to raise rates to cover their suddenly increased costs, a vicious cycle that would drive even more men away. How long would it be before the insurers faced a Freddie/Fannie crisis and went to government demanding a bailout? Robach and Snyderman argued that much of the increased costs associated with the women buying these policies is due to their child-bearing, and that as a matter of social policy we don't want higher insurance rates to discourage women from having children. Maybe so. But in such case, let government directly subsidize the cost of child-bearing. Pushing those costs onto the private sector distorts the market and leads to the kind of negative consequences described above. Snyderman tried to explain away the fact that insurers charge young men more for auto insurance. That's based on their "risky behaviors," she asserted, whereas young women are being charged more based simply on increased "access" to health care services. How can I put his politely? Baloney. Insurers aren't Puritans punishing young guys for immorality. Nor are they baby-hating meanies. Call it risky behavior or increased access, but to an actuary it amounts to the same thing: higher projected claim costs. We've just had history's costliest lesson in the diastrous consequences of government meddling in markets. But the MSM never learns. Note: NBC couldn't even seem to keep its numbers straight. At one point in the segment the claim was made that some women "can pay 140% more." A bit later, it was asserted that among states that gender rate, some insurers charge a 40-year old woman "up to 48% more." So which is it: are women paying 140% more, or 48%? I'm guessing Snyderman meant to say that women are paying "140% of what men pay," rather than 140% more. But hey, what's a hundred percent among friends when feminism is at stake?